Her career began in the late 1970's, and Rumiko Takahashi has became a beloved mangaka that has had nearly every series she has ever authored, get the anime treatment. 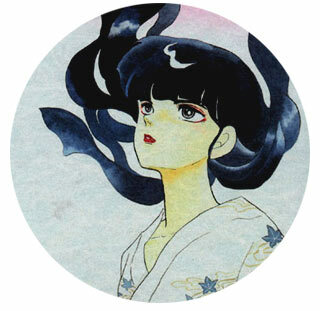 Anime and manga fans should know who she is, and for many American viewers, being introduced to Takahashi title like Inu Yasha or Ranma 1/2 may have been their entry point into the world of anime/manga. So Mermaid Saga originally published in the 1980's is definitely not unfamiliar to anime watchers of Mermaid Forest that was originally released in 1991, and then re-released in 2003. This is the source material for the anime OVA adaptation, therefore if there are parts that the anime skipped; consider reading the four volumes of this manga for the entire story. 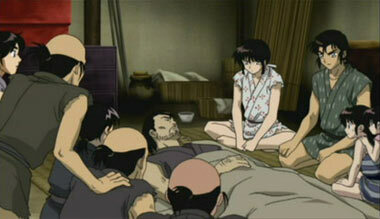 You may have been exposed to either Takahashi's other works or the happy drawings of Disney's The Little Mermaid. So encountering this work is going to definitely widen your eyes. Mermaids portrayed in this title are not as beautiful or loving as Ariel was, but if humans eat their flesh then they can stand the chance of gaining immorality. Now, if you have the opportunity would you persist on obtaining this chance? Then if you are lucky how would you spend your life? 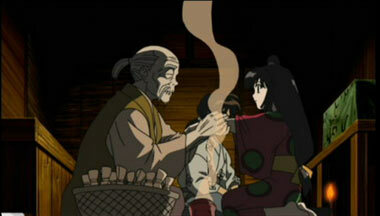 In the first volume of this Saga, the chapters were linked by two recurring characters: Yuta and Mana. 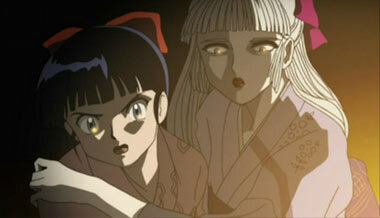 They are both humans cursed with immorality, and seeking to regain humanity, Yuta it appears more so than Mana. The art of the Mermaid Saga is dated and typical Rumiko Takahashi style, with many drawn character similarities from InuYasha, or Ranma 1/2. While Mermaid is not as scary as other horror works, say Kazuo Umezu works, but the sadness and horror of what human greed is quite scary enough. Mermaid Saga has became a pretty short series to run through. If you've heard of Rumiko Takahashi before and you're about to write Mermaid Forest off as yet another love story, you are making a mistake. Not only is this NOT a love story, it's not even bright and cheerful as her usual works are. Based on her Mermaid manga series, Mermaid Forest starts us off in the middle of the story's timeline but the anime itself alternates between the past and the present, so you don't feel confused. This dark tale about human relationships and greed does not lack anything that can make your skin crawl. If you are a visual person, it has buckets of blood and mutated monsters galore. What we love about Mermaid Forest however is it shows you just enough to make you imagine what comes next. Just as Alfred Hitchcock can make us "see" Psycho Norman Bates bloodily slashing Janet Leigh in the shower with just her scream, his knife, and that music, Mermaid Forest makes us cringe with just a scalpel and a skinned human face. Although Mermaid Forest tried to be faithful to the original artwork from the manga, it has been 10 years between the two and certain things needed to be updated: darker colors, more shadows, and more angles. All in all, this update accentuates and brings everything closer to the eeriness and disturbing feel of the story. Below: Scenes from Mermaid Forest. 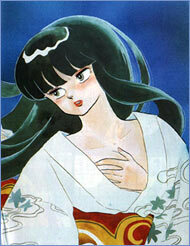 Below; Artwork from the manga Mermaid Forest.